News of making a sequel to A Quiet Place (which raked in $50 million on its opening weekend) was doing the rounds before I had even bought tickets to see the film. That’s planning and determination for you, I thought. But after watching the 90 minutes of smartly edited suspense, I thought maybe it’s not unthinking monetary ambition but the pleasure of job satisfaction. There’s big heart behind this horror film. Directed by John Krasinski (of The Office fame) and written by Scott Beck, Bryan Woods and Krasinski himself, the film has thrilled audiences. Earning $22 million by its third weekend since release, the film financially sits behind major horror flicks The Sixth Sense ($24 million in 1999), I Am Legend (2007), Jurassic Park (1993) and Jurassic World (2015) and It ($29 million in 2017). A Quiet Place is a horror film so far as it is a story about terrifying monsters as much as Spielberg’s sci-fi Jurassic Park. But it explores more than just the fear factor: relationships among characters are as real and fleshed-out as in a drama, and its themes centre on parental love, self sacrifice and staying 'human' while avoiding death-by-monster. What may puzzle you are the opening scenes which lay out an apocalyptic, noiseless world, bare of people and very much like life in the wild country despite being set in the near future. The plot follows one family, the Abbots, and their course of surviving among inhuman predators. The monsters even sort of look like the CGI-augmented Dilophosaurus of Jurassic Park, but I’ll leave it to you to judge which creature would be more terrifying if it inhabited your world. Moreover, the creatures are blind and hunt by sound — they have bionic hearing and are stealthy because they are super fast, so fast that in the first couple of attacks you aren’t too sure what they look like. They come out of nowhere, emerging within seconds, and their prey as good as vanishes before your eyes. As the film progresses, the suspense only builds up, and the predators are revealed nearer and nearer in the camera frame. Until, towards the end, you see one in full view. And it’s not pretty. The family has charted and marked out safe places and paths (with what looks like white chalk powder) in the abandoned countryside of what is now upstate New York, where they reside. They have codes and have devised plans (strings and strings of bulbs around the house to call for help, though none seems anywhere close) for emergencies and attacks — as much as they can. The violence and sense of impending danger come across palpably as a jarring contrast to the quiet and gentle inner life of a family who express their emotions through sign language and facial expression; they walk barefoot even outdoors in order to avoid making any noise. The action hits you smack in the face at the outset. You may be taken aback for a few moments, thinking you have witnessed the climax scene already. How will this now unravel, you think. Flashbacks only? So, yes, that should prepare you for the numerous shocks and starts in the rest of the nearly dialogue-less story. It’s all about the tenacity for survival. The themes in the movie are treated almost in the language of symbolism due to the absence of uttered lines. But despite stripping the film of spoken conversation, the story is told simply through the Abbot’s minimalistic existence. Lee and Evelyn (Krasinski and co-star and wife Emily Blunt) and their two children (Noah Jupe and Millicent Simmonds) live a domestic life oppressed by the strain of guilt, anger and fear, after witnessing the youngest of their family snatched by the monsters only feet away from them. The primary focus apart from survival is parenthood, and more so, a father who is misunderstood by his daughter. Despite their dire and lonely circumstances, Evelyn home-schools her children, and in one touching scene is teaching her son mathematics shortly before he is called off by his father to accompany him to gather supplies out in the monster-ridden wilderness. The silence is expanded by one main character, Regan the daughter (Simmonds), who is deaf. And it adds poignant realism that Simmonds is in fact hearing-impaired. She delivers a spunky performance of a strong-willed and angsty teen, sensitive to everything her dad says. How do we retain our humanity when almost every aspect of daily life is dictated by the struggle to survive, stay safe and avoid unspeakable horror? 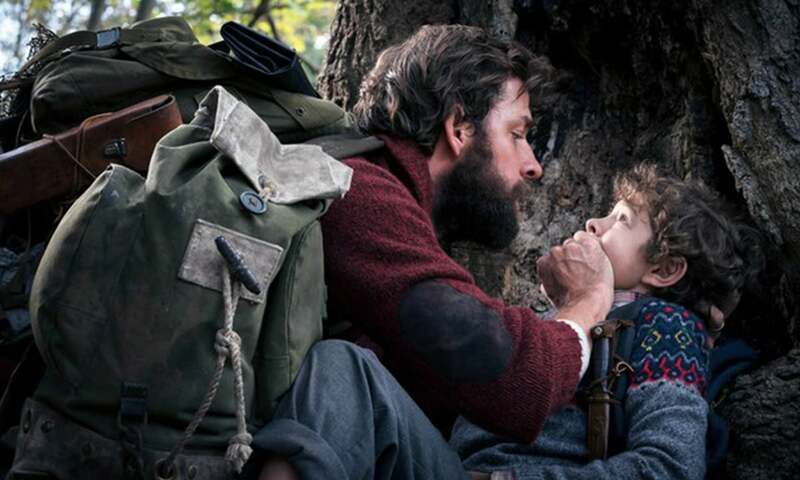 A Quiet Place gives audiences some quiet suggestions. The writer is a journalist working with daily Dawn. I watched it a month ago and loved it enough for it to linger in my head for a long time. So glad that there is a sequel in the making!